Salt-X = SaltX Home Uses! Very few things can top the investment of a home. Many of us dream of the day when we can have a place of our "own". With the cost of a home being what it is, those fortunate enough to own this property do not want to see it eaten away by salt damage. It is no secret the damage that can be done by salt, and the old myth that fresh water will remove salt is blown away when you look at all of the rain the coastal areas normally get, and then look at all the damage done by salt!!! Those gentle sea breezes carry salt spray inland for many miles and even those who live 5, 10 or more miles from the ocean can suffer the damaging effect of salt. Houses, plants, air conditioners, windows, window screens, metal buildings, vehicles, and more, all suffer from the cancerous effect of salt. Paints and fabrics fade quickly due to the bleaching action of salt and sun! Hurricanes and other severe coastal storms can really wreak havoc with salt spray!! Water-soluble salts and other minerals that migrate to the brick's surface cause efflorescence. Brick is porous and will allow water to sweep thru. 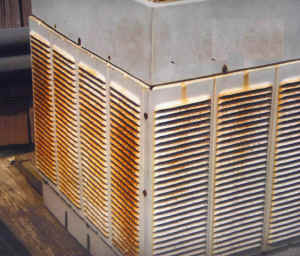 As the salty water evaporates, it leaves white stains on brick and stonework which is difficult or impossible to remove. 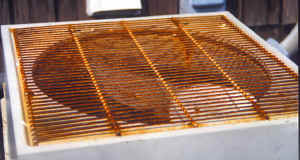 Initially, the stains are soft and can be removed with a good wire brushing, but in time the stains become a difficult chore to remove. 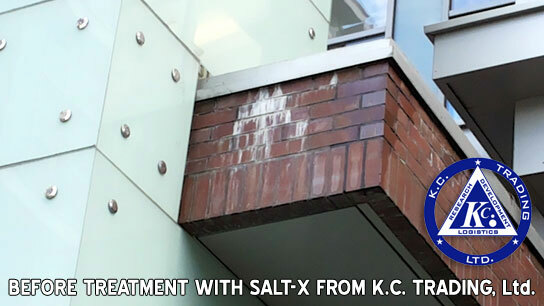 Enter Salt-X the most effective method of removing the white brick stains also called efflorescence. Simply mix 2 oz of Salt-X per gallon of water and spray with a power washer or garden sprayer. Allow the brick to dry and then repeat until all the stains are gone. It may take several attempts as the Salt is leeched out from deep within the brick. This Cost To Replace This Heat Pump Would Be Expensive! 10 Seconds Of Spaying With SALT-X Will Prevent This Type Of Damage! How Could This Happen? It Was Painted At The Factory! It Doesn't Take Long For Salt Corrosion To Find It's Way To Metal! SALT-X Finds & Stops Salt Dead In It's Tracks! 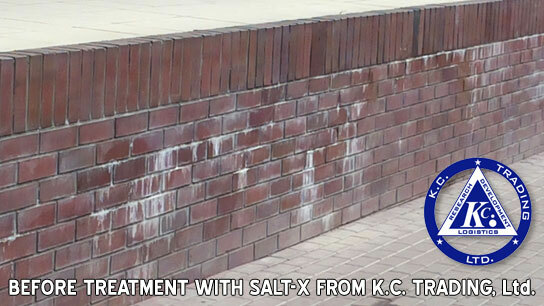 These problems can be kept to a minimum now, thanks to the effectiveness of SALT-X to remove salt crystals and salt film from virtually any surface!! 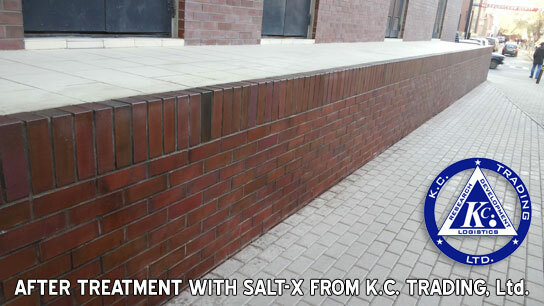 Internal laboratory analysis and extended use by home owners, has proven that SALT-X will effectively remove salt from all surfaces found around the home as well as from decorative plants/grasses, shrubs, trees, etc., without harmful effect!!! To protect your home, condo, mobile home, business or other belongings, follow these simple directions! We suggest you use our AUTO-MIX UNIT with SALT-X when doing a total rinse down of your building and other property after a storm or as part of your preventive maintenance. The AUTO-MIX UNIT is easy to use as it attaches directly to the faucet and uses a standard garden hose with hose end nozzle. Follow directions on unit. You can also use a pressure washer that has been set at 2 ounces per gallon (1-64 dilution). Start at the top of your dwelling or building and start rinsing thoroughly, working your way down to the bottom. Then you can rinse your plants, shrubs, trees, air conditioner, etc. Everything around the house! Then let air dry!!! There is no need to rinse after using SALT-X! For periodic use, keep a 3 gallon pump up garden sprayer available with SALT-X solution for use on windows, screens, doors, air conditioners, vehicles, boat lifts, etc. Protect that major investment from the ravages of salt with SALT-X! There are NO cleaning agents or solvents contained in SALT-X, so you can have peace of mind guarantee that you are removing only harmful salt, not paints, coatings, etc. 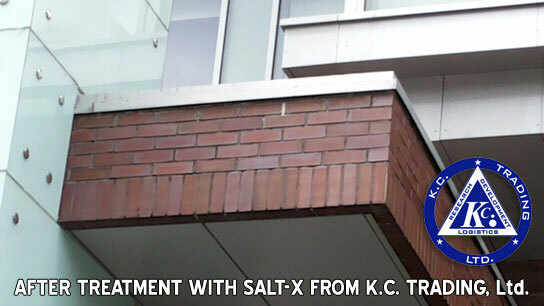 SALT-X……..the number one choice for safe, effective removal of salt!! !